The S8 Subwoofer delivers great bass performance and provides low, tight, and smooth bass. How do you set the crossover of the S8? The S8s crossover is a variable low-pass filter. This means it variably adjusts how high the S8 will play. The best setting will depend on the individual size and shape of the room, the placement of the sub in that room, and even personal preference, which is why we don't have any one specific recommended setting. We usually recommend starting with the Crossover knob turned all the way counter-clockwise. Then set the S8 Volume close to where you think it should be and make small incremental adjustments to the crossover and volume settings from there, to see how everything sounds. Finally when making adjustments, assess them from the same spot each time, preferably from where you'll listen from most often. 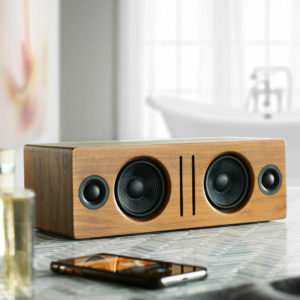 Audioengine powered speakers have fixed passive crossovers designed specifically for them; this simply means that they are designed to play the frequency range they produce, so it's not necessary to alter this when adding a subwoofer. Adding a subwoofer, such as the S8, will pick up where the speakers leave off, extending the low end response. Can the S8 subwoofer be used with the A2 desktop speakers? I don't see any audio outputs on the rear of the A2 speakers? With the original A2s (not the A2+ model), there are two ways to connect a powered subwoofer to them like the S8. The S8 has two inputs and an output, so you could send the audio signal into the subwoofer from your source, and then use the output to connect to the A2s. The other option would be to send the audio signal from your source into the A2s, and then use the opposite connection, meaning the input that is not being used, as an output to connect to the input on your subwoofer. Both inputs on the A2s will act as outputs when audio is sent into either the A or B input; this simply means that if you're sending audio to the mini-stereo input of your A2s, the RCA input will actually output to the subwoofer. Can the S8 subwoofer be made wireless? Yes! You'd just need a wireless adapter like our W3. What surface should I put my S8 on? We typically recommend using the S8 on a carpeted floor or with some padding under the feet if you have it on a hard floor, as you may notice unwanted noise and/or vibrations from the subwoofer feet on a hard surface at higher volumes. It's worth noting that placing your S8 on a carpeted area will not affect the sound. How do I control the volume of my S8 subwoofer? Do I have to reach behind the S8 everytime I want to raise or lower the volume? Most Audioengine powered speakers have variable RA outputs for use with a subwoofer like the S8. This means that the output of the speakers and the RCA output will go up and down together. So once you dial in the volume of your S8, you should be able to adjust the volume from the speakers, or your source device. Either way the subwoofer and speakers should stay in balance as the volume is raised and lowered. Yes! You would just need an amp, like our N22, to supply power to the P4 speakers and connect to the S8.